Scientists are releasing gases and fluorescent particles into Boston's subway tunnels on Friday to study how toxic chemicals and lethal biological agents could spread through the nation's oldest subway system in a terrorist attack. It's part of a weeklong study commissioned by the U.S. Department of Homeland Security to figure out ways to quickly minimize the impact of an airborne assault on the nation's 15 subway systems and protect the nation's infrastructure. U.S. subway systems include 810 miles of track in tunnels and accounted for about 3.45 billion trips taken last year, according to the American Public Transportation Association. A non-toxic, odorless gas will be released into the MBTA subway system during the afternoon commute Friday, reports CBS Station WBZ in Boston. 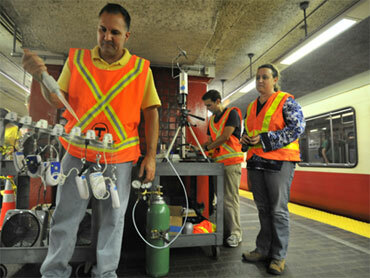 Researchers in subway cars, at T stations and in the tunnels will test the air to see how the gases spread. The scientists are monitoring concentration of the gases and particles as they move throughout the system and then up into the streets above, pushed by turbulence created by trains thundering through the tunnels. Researchers use electronic devices to take air samples at more than 20 Massachusetts Bay Transportation Authority stations and in subway cars. Test results will be used to craft ways to quickly detect an attack so authorities can shut down subways to limit the spread of contaminants. Federal officials say similar tests were conducted in 2008 in the Washington, D.C., area, serving as an excellent contrast to the Boston study. The Massachusetts subway system, which opened its first tunnels in 1897, is poorly ventilated, while Washington's is relatively modern and well-ventilated, DHS officials said. Abel Girmai, an aspiring actor from Cambridge who rode Boston's Red Line on Friday, said he thinks about the possibility of an attack "all the time" and supports studying how a biological attack would play out in the subway system. "Anything that has to do with security, I'm with it," Girmai said. "I think at certain times, we do get in a comfort zone. Americans are like that. We don't think something like that will happen, but we have to get out of that mode." Donna Derochers, a legal secretary from Halifax, said she wasn't thrilled with the idea of the study. "It's scary because you are going to find out what could actually happen. You might not want to know," she said. "You may not want to ride the 'T' ever again." Though the study focuses on the deliberate release of chemical or biological agents, it also will help researchers understand airflow characteristics for smoke or unintentional spills of chemicals or fuels, DHS said in a statement. The potency of a chemical or biological attack on underground tunnels was demonstrated in 1995, when a Japanese cult used the deadly sarin nerve gas to attack the Tokyo subway system, killing 12 people and injuring hundreds of others. In the U.S., authorities thwarted an al Qaeda-sponsored plot to carry out three coordinated suicide bombing attacks on New York City subways last September. "The MBTA is working closely with our federal partners in order to make the transit system as safe as possible," MBTA Transit Police Chief Paul MacMillan said. Using a $3.2 million federal grant, the New York Police Department plans to conduct its own study next year in the city's subway, a sprawling 24-hour-a-day system with 468 stations and an average of 5 million riders a day. "In addition to air flow in the subway itself, we want to observe the unique dynamics of air flow between New York's high buildings and a relatively shallow subway tunnels," said NYPD spokesman Paul Browne. Physicists and engineers specializing in aerosol physics conducted similar tests in Boston about eight months ago. The tests are being done in both winter and summer months because temperatures and humidity can affect the movement of airborne contaminants, said Teresa Lustig, program manager at the DHS's Science and Technology Directorate. This time, officials are also testing the effectiveness of some of the proposed strategies crafted after scientists analyzed the initial tests, Lustig said. In both studies, researchers released plumes of sulfur hexafluoride, a common tracer gas used for indoor and outdoor air testing, and perfluorocarbon gas, which is used in eye surgery and other medical applications. The study involves 30 researchers from: Argonne, Ill.-based National Laboratory, Berkeley, Calif.-based Lawrence Berkeley National Laboratory, Arlington, Va.-based ICx Technologies, Defence Science and Technology Laboratory of the United Kingdom and Chemistry Centre of Perth, western Australia.